Capitalists@Work: Capitalist Archbishop @ Work? Churchmen frequently see fit to weigh into the affairs of Mammon - and why not, they have their sermons to write and they know what people are interested in. There are, after all, biblical precedents - and, let's face it, quite a lot to pontificate upon. 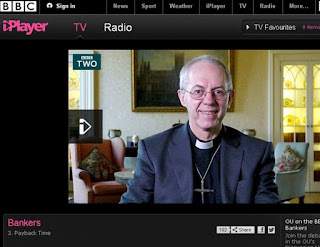 Watching the Beeb's rather good latest episode of 'Bankers', I was struck by the balanced contribution of our new Archbishop, Justin Welby, and minded to post about it here. Turning to i-player for the appropriate link, what do I find but himself as the frontispiece ! Not merely a talking head, it seems, but the talking head. How gratifying for the CofE. Welby is an interesting cove, having worked for many years in the oil industry before the voice of God called him to the ministry. And now a financial commentator too. He is welcome to write a guest post here any time he likes. 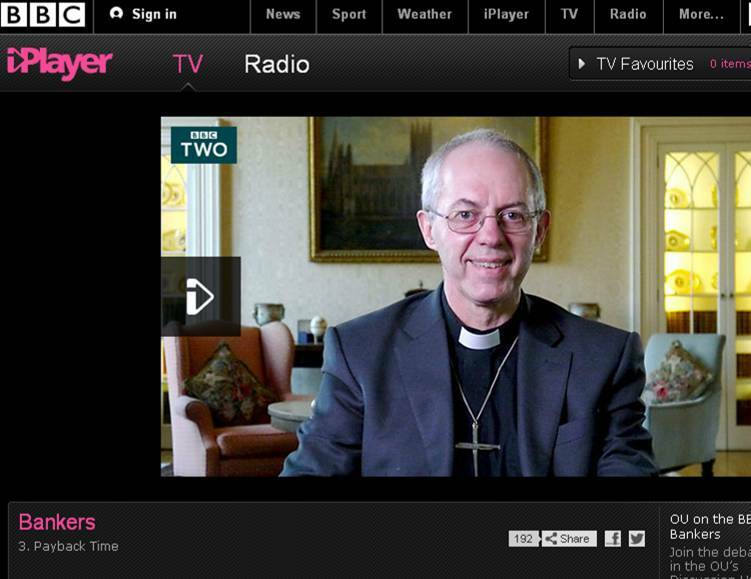 Welby seems an interesting chap. I look forward to the day when the church invites top bankers and leading businessmen to critique religion, the scriptures and morality. It'd would only be fair, no? He could always begin by sacking the Church Commissioners, eh? I was outraged recently to see a fine local ex-rectory that those buggers had let rot away because they had neither let it nor sold it. What a waste and what a loss. What happens if he suggests selling ploughshare stocks and buying swords? We could call the geordie bank, oh, I don't know -- Northern Rock ..? The end of state/regional Banking was the very first act, on the very first day, of the incoming 1933 Roosevelt administration to take over, via bailout, the terribly under capitalised and bankrupt state banks. federal insurance guarantees stopped the banking panic almost overnight.
""" Churchmen frequently see fit to weigh into the affairs of Mammon - and why not, they have their sermons to write and they know what people are interested in. There are, after all, biblical precedents - and, let's face it, quite a lot to pontificate upon. Watching the Beeb's rather good latest episode of 'Bankers', I was struck by the balanced contribution of our new Archbishop, Justin Welby, and minded to post about it here. Turning to i-player for the appropriate link, what do I find but himself as the frontispiece !"""